If you’re ready to take your business to the next level, but you need an injection of cash to help achieve your growth ambitions, there is a variety of possible funding options to explore. It used to be the case that if you needed money for your business you had to apply for a bank loan, with few alternatives to consider. However, in today’s varied finance market, there are many options to look at – whether you’ve been refused a bank loan, or you’d just prefer a more tailored solution. While this new market of alternative lenders opens up a whole new world of opportunity for businesses, it can be tricky to narrow down what’s on offer and what would be most suitable. In this article, we’ll introduce five of the possible funding options which could take your business to the next level. An unsecured business loan could be an option if you don’t have assets in your company to provide as security, or you need the money quickly – for example, if you’re growing fast and need to seize an opportunity. As with most funding options these days, there’s a variety of lenders providing unsecured business loans, with varying products for different situations. There are even lenders offering up to £250,000 in the right circumstances. Because the lender doesn’t have an asset as security if you default on your payments, unsecured loans usually place a greater emphasis on the trading history of your company, so you’ll need to be able to demonstrate some decent accounts. The lender will also ask for a personal guarantee, which means you as a business owner or director will be held personally liable if the business can’t pay what it owes. If you’re confident in your business, unsecured loans can be a good option. You can usually secure one quickly, the upfront cost is lower, or not required at all, and no assets are required. This flexibility and convenience often comes at a higher overall cost though. Peer-to-peer lending is an interesting funding option which has grown in popularity in recent years. It offers a realistic alternative to bank finance and is considered one of the most accessible solutions available. You’re essentially borrowing from a pool of private investors, rather than one bank or lender. It works because it provides investors with a better return on their investment than is offered by a savings account. It’s mostly administered online by a peer-to-peer lending company acting on behalf of the collective investors, and you’ll be required to provide information about turnover, profits and trading history, just as you would when applying for any loan or funding facility. If you meet the initial criteria, your request will be opened to the platform of investors, either through an auction process, or simply by waiting for investors to choose your business to invest in. Peer-to-peer loans are usually unsecured and quick to set up, but the interest rate may be higher than traditional forms of lending. Many businesses would find it easier to finance growth if only they could release the cash from invoices sooner – i.e. get paid for work as soon as it has been completed rather than waiting weeks or even months to receive payment. Invoice finance provides an answer to this common cashflow problem and could be just enough to help you reach the next level. It involves a lender taking the burden of the debt for you, so that once an invoice is raised the lender will advance you the majority of the value – typically around 85% – within a couple of days. When the invoice is paid by your customer, the money goes straight to the lender, and they will then pay you the remainder minus an agreed service charge. While all invoice finance works under this basic principle, there are variations depending on how involved you want the lender to be and whether you want to include all invoices or just some. A revolving credit facility is best described as a loan that can be renewed automatically. It provides businesses with the working capital needed to take advantage of sudden growth opportunities or to bridge cashflow gaps. It’s not dissimilar to the now less common bank overdraft, in that it provides a pre-approved pot of money that you dip into when you need it. You’ll have an agreed credit limit and can withdraw up to that amount within the term of the facility. Once you’ve taken funds, your terms will state how long before you need to start making repayments and you usually only pay interest while money is outstanding. It’s a rolling agreement that automatically renews once you’ve repaid a certain amount – therefore giving you steady access to cash without having to apply for a new loan each time. This is a flexible, short-term option that can provide cash within hours, so it does have a higher interest rate, but can be a worthwhile safety net to have in place. Sometimes it’s a piece of equipment that you need to help drive business growth. You might need new machinery, or an additional vehicle, for example, and asset finance could be the way to do it. While there are many different forms of asset finance, and specialist lenders for particular items, the options broadly fall under the categories of leasing or hire purchase. Hire purchase enables you to buy an asset but without having to pay for it upfront. While you will effectively own it from the outset, you pay for it in monthly instalments over time. If you default on the repayments, the asset is taken back. Leasing is essentially renting the item for a set period of time for a monthly fee. At the end of the term, you give it back. You can also upgrade to a newer model, or, with some products, you can choose to buy it by settling the remaining balance. The main advantage of leasing is flexibility, while hire purchase is usually a better option for equipment you’ll need over the long-term. 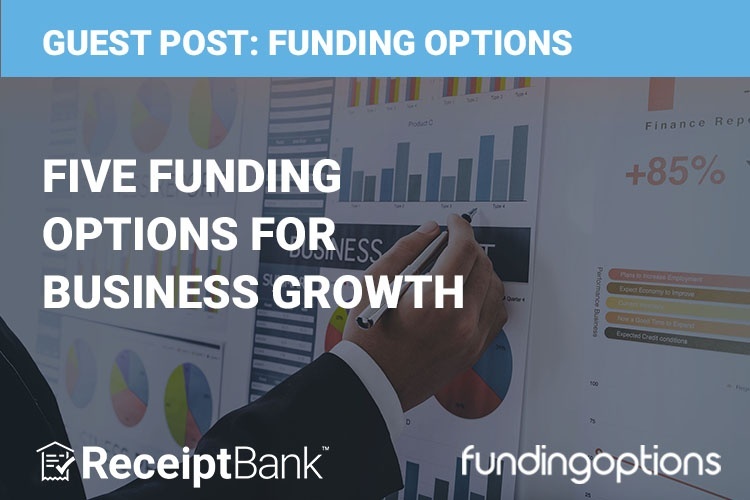 Although we’ve only just scratched the surface for financing business growth, this article has hopefully given you an overview of some of the many funding options to explore. It’s not a one size fits all approach, as what suits one business may not work for another, so it’s worth taking the time to weigh up what meets your needs best when going for growth.